Each year the Royal Astronomical Society hosts the National Astronomy Meeting for RAS members from UK and now in collaboration with the German Astronomical Society. 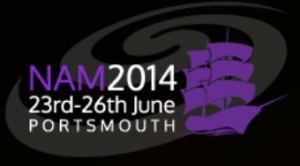 This year NAM will be held in Portsmouth and XRT-S will be joining them for the first day of parallel sessions in the public Engagement section with the hopes of presenting the project with a poster and talk. The XRT-S team will be heading to the BIG BANG SOUTH WEST event at Exeter's Sports Hall to show off their latest model and enjoying the art of biscuit decorating. So make sure you pop along to have a chat with the team and let us know what you think of the project so far. We are always open to new ideas and any projects you think it would be good to get involved. The final stage of procurement see purchasing of the Dish, to be shipped direct to Caradon and any other misc items that we may have forgotten or need for the build. XTV to put together a shooting plan for filming of the build. We're going to be at Sidmouth Science Festival all day on Saturday 18th October. We'll be decorating biscuits and talking about some of the exciting science we plan to do with the radio telescope. Come and join the new Space:Exe society. Membership is £8. Not only we will be building the project this year but we are also doing lost of other space-y activities! Our parent society is doing it's first social of the year; water rockets on Exmouth sea front. Find out more about the event on the Facebook event page. Departing from Peter Chalk Centre at 11:30 to catch a train to Exmouth.